I've had the Van-O-Meter development board sitting around and finally put it to use the other day. We've been getting some cold nights lately and I wanted to see what the temperature was getting down to in the van. I don't have an exterior sensor so I compared the van interior temperature with the local airport temperature data. I can see the airport from camp, it's only a couple miles away so it should be pretty close to the actual outside temperature. 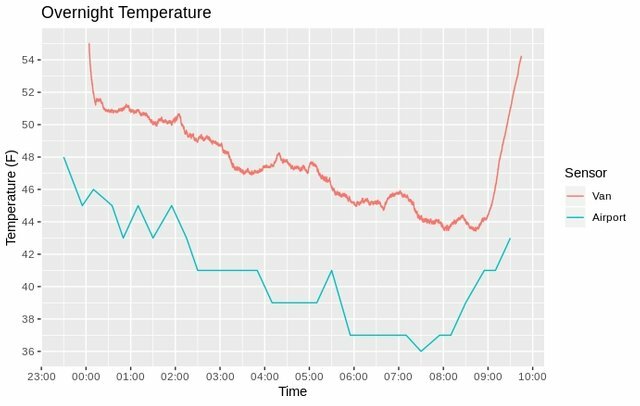 It's clear from the data that the van temperature sensor reading is offset by approximately 6 degrees from the airport sensor outside temperature. The development board temperature sensor is factory calibrated. So either the board is putting off some heat, the van interior stays warmer than outside, or there is a significant temperature differential between my location and the airport. Not really sure which it is yet, need to do some more experimenting. The airport sensor got down to 36 and the van sensor got down to 43. That's sleeping bag hibernating temperature for me. You got a smart thermometer on ur rig? I suppose. It's a microcontroller development board with a bunch of environmental sensors like temperature, humidity, pressure, and other stuff. It communicates over bluetooth so I can use an app on my phone to monitor the data and stream it to the internet. No, I haven't. I'm a bit of an EFM32 fanboy. I like the low power features, development tools, Linux support, and open source hardware/software. I have the comma.ai panda for reading data off the CAN bus through the ODB-II port on the van. That has the ESP8266 in it which is the predecessor to the ESP32. Sounds like a fun project. My victron charge controller has a built in load disconnect when the battery voltage drops too low so I don't need to build that. I'd like to add a CO and maybe gas sensor to the board if I ever get around to it. I hear ya on the money. if the battery gets to low the inverter switches off, but it makes that neverending beep sound, hope the new one is not so loud.. So you made a PCB? Ah, ya I'm only powering my laptop, phone, and at times LED lights/fan. I just have a cheap 175W inverter. That'd be cool. Are you going to have a separate cell radio hot spot in your van in addition to your phone then? wifi depends on the country, i have an old router with openwrt running, i can connect it as client to any open wifi, it has a better range than cellphones/laptops, at the same time my private wifi is running on that router, where all my devices connect to, so when i come to a new location i only need to setup the new connection on my router. it works best with a router with 2.4ghz & 5ghz, openwrt doesn't support all 5ghz chips.